There are numerous signs of inter-religious hostility, hatred, oppression and mass murder in the world -- primarily in the Middle East. There are stories of ISIS placing Iraqi and Syrian Christians in cages or coffins and burning them to death. Christians in some areas are forced to either convert to Islam, flee the country or die. "... fits the definition of ethnic cleansing." "The Islamic State seems committed to expunging all physical traces of Christianity in areas it conquers. It has demolished dozens of ancient churches -- up to 400 churches have been destroyed during the war in Syria alone -- not to mention countless crucifixes, statues, graves, and other relics. The Islamic State has ordered the University of Mosul to burn all books written by Christians, and decreed that the names be changed of all Christian schools in Mosul and the Nineveh Plain. Some schools have been there since the 1700s. There is also intra-religious hostility and violence within Islam, largely between the two major traditions in that religion: Sunni and Shi'íte. In spite of all these horrendous developments, there are a few isolated hopeful signs. There are a number of locations in Egypt, France, and Norway in recent years where Christians and Muslims are protecting each other's places of worship. Two recent instances of cooperation against terrorists are described below. More than 10 Somali militants, believed to be al-Shabab terrorists, stopped a bus near the city of El Wak in Mandera County. 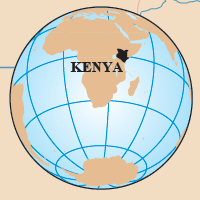 It is in northeast Kenya close to the Somalia border. The attack started similar to one during 2014-NOV in the same area of Kenya, that was perpetrated by al-Shabab terrorists. That time, they pulled 28 non-Muslim passengers from the bus and shot them in cold blood, leaving no survivors. This time, they ordered the passengers to get out of the bus and form two groups: Muslims on one side and everyone else on the other. They said that the Muslim passengers would later be able to get back on the bus and would not be harmed. But this time, things went differently. The passengers refused to be separated by religion. Abdi Mohamud Abdi, a Muslim passenger on the bus, told Reuters. "Cult of death knows no race or religion. So is al-Shabab. They're to be treated as common enemy of humanity." "True love. This are heroes and must be recognized for their courageous act. Thanks be God." "The Somali people on that bus did a good job, protecting their follow Kenyans! All the passengers should be invited to State House and the president should honor them with medal of braveness and the medal of patriotism! I thank all Muslims passengers for taking a tough decision to protect our follow Kenyan brothers and sisters. "... The greatest gift given to the nation, Kenyan people and -- "non-local" -- passengers on the Mandera bound bus, as the year draws to an end, was a spontaneous decision by patriotic Kenyans -- who happen to be of the Moslem faith -- to come to the immediate defense of their fellow Kenyans in the name of peace, brotherhood, citizenship, humanity, against senseless violence, and above all remaining true to their faith in the face of imminent death." A Nigerian Muslim terrorist group has been attacking both Christians and Muslims in Nigeria -- often in their houses of worship. The group is called Boko Haram which roughly translated means "Western education is forbidden." They have also organized attacks on churches and mosques in the adjacent country. Cameroon. It is located immediately East of Nigeria. The two countries share a long border.